There are several myths circulating about the extraction of shale gas, coal bed methane and other unconventional fossils, through different methods, notably hydraulic fracturing. These include: – that the extraction of such fuels will bring prosperity to Europe – that we can replicate the economic boom of the US, without repeating their environmental mistakes – that shale gas and other UFFs are necessary transition fuels – that they are good for the climate – that we do not need any extra legislation in Europe to regulate these technologies – that the risks to public health are minimal. These are just some of the many myths which will be discussed and debunked during the Greens/EFA Group’s morning conference on unconventional fossil fuel extraction, alongside in-depth discussion of the legislative framework, and examples of “fracking-free” campaigns in Europe and the US. Speakers include researchers, academics, campaigners, economists, activists, NGOs, engineers and other stakeholders in this debate. There will be plenty of opportunity for questions and debate from the floor. 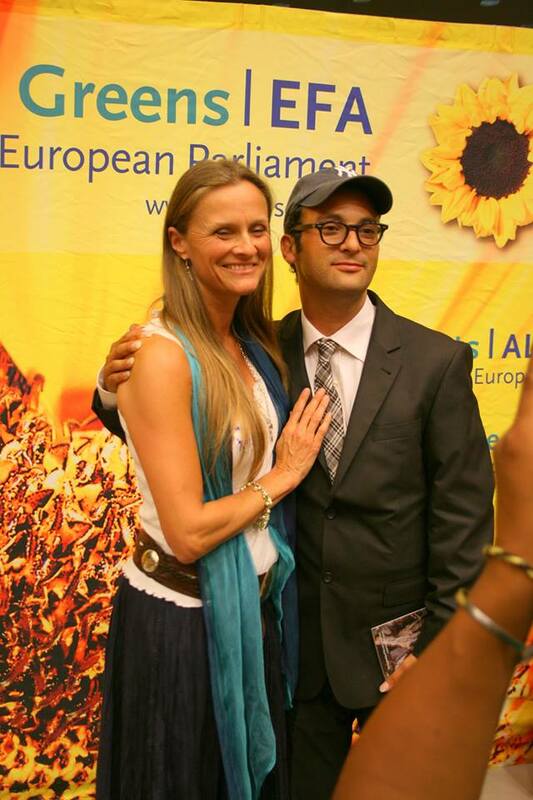 Our good friend and leading UK fractivist, Vanessa Vine, with GASLANDS film maker Josh Fox at the event. This entry was posted in Uncategorized on September 7, 2013 by Bridgend's Green Leftie.